I have been feeling a little under the weather recently. Partly due to the bronchitis I had to take a weeks worth of antibiotics to clear and my little son who is teething and ill at the same time. But a lot of my lack of energy is resulting frankly for overwork and a lack of energy. I have the 9 to five work and the five to nine phase, where I am mommy in chief. So when I had to go on a business trip to London recently, I was sort of looking forward to getting away for the day. London is one of my absolute favorite cities in the world. It has an energy and a vibrancy which always instantly lifts my spirits. If I had not met and married DH, I honestly believe I would have ended up living in London. I did live there as a child. And another piece of trivia, DH and I first met up in London. I was able to meet up with a childhood friend after work and I walked from Liverpool street station, through the bank and insurance district, saw the Gherkin and Lloyd's building up close. 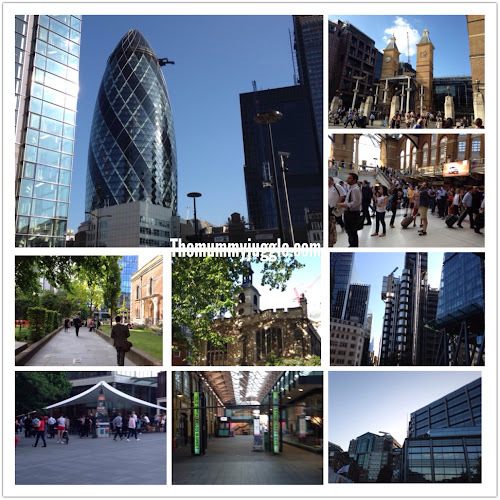 We also walked through Bishops square and old Spitafields market. It was just a couple of hours, but it felt like a micro break to me and I definitely came back refreshed. I am glad the whole family is heading off for an extended weekend soon. P.s. Congratulations to the Duke and Duchess of Cambridgeon the arrival of their son.